This very pleasant Tea is given as a special nutritive tonic, to be combined with CALCA for increased effect; with ELECTRA, to add to its calming influence, or simply to provide a soothing, nourishing cup of warmth at the end of a long day. The Oat Straw and Horsetail provide substantial amounts of Silica. This element stands at the ‘top of the heap’ of those key elements/minerals needed by the body. Useful as Silica, or, able to be transmuted into other elements as and when needed. For further information and a detailed explanation of the process, we refer the reader to the book ‘BIOLOGICAL TRANSMUTATIONS’ by Louis Kevran PhD, a French scientist. 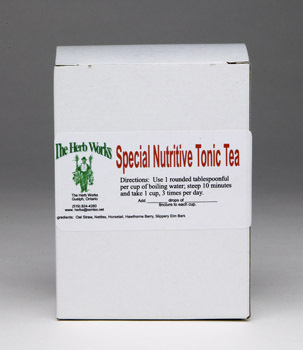 In combination with Nettles and Oat Straw, this Tea also supplies an abundance of Magnesium. Further, Potassium, Calcium, Iron and other minerals are readily available, thanks to the simple and innocuous Nettles. We have added Hawthorn Berries as a useful adjunct to a Tea designed to help sooth and calm; and the Slippery Elm as a demulcent for irritated tissues.